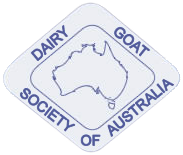 All-brown goats had appeared from time to time in dairy herds in Australia, but it was not until the 1990s that some breeders decided to keep them and try to establish them as a breed. Browns had come from Saanen, Toggenburg and British Alpine backgrounds. At the beginning of the 1990s all-brown stock were to be found in three states in sufficient numbers to enable breeders to exchange stock and begin a breeding programme. In Victoria a large enough herd was developed for brown to brown matings to occur. These matings produced consistent type and colour and it was determined that the solid coat was recessive to white Swiss markings. They had good udders, were high producers of milk and had good butterfat and protein levels. They also had extended lactations and here noted for their ease of milking. In April 1996 the DGSA provided an Experimental Listing that included an ‘All Brown’ standard. This register operated for ten years before being reviewed. During this time numbers of Browns increased and they were given access to the show ring in Victoria by the introduction of ‘any other variety’ classes. They were also permitted into udder classes to be assessed alongside existing breeds. Elegant, with dairy quality. Fine without tending to weakness. An alert expression and stance, combined with a docile temperament. Does feminine, bucks obviously masculine in appearance. Facial line straight, level or slightly raised bridge.Polled or neatly disbudded. Eyes full and set well apart. Ears neat to long, erect and pointing slightly forward. Blending smoothly into shoulder. Does long and fine, bucks fine and strong, not coarse. With or without tassels. Back strong, straight and rising to the hips or horizontal. Withers fine and high, blending smoothly and finely into shoulders. Chest wide and deep in bucks, showing medium width and depth in does. Long, deep wedge shaped. Well sprung ribs good abdominal capacity. Gradual fall from hips to tail, good width between hips, thurls. Rump broad and strong. Long, strongly-boned legs, but not coarse or heavy. Front legs straight and parallel viewed from rear, hocks slightly bent when viewed from side. Pasterns fairly short and strong. Hooves sound and well shaped, dark brown or black horn. Back attachment high and broad. Fore attachment carried well forward and blending smoothly into abdomen. Not pendulous or unduly divided. Showing good capacity. Skin brown to soft brown-black, softly textured. Scrotum well attached, relatively even and not divided or unduly pendulous. Carrying two testes. Of adequate size for ease of hand milking, well attached and distinct from the udder. Set well apart, pointing slightly forward and down, not outward. Allowing good milk flow. Two. Set wide apart, slightly to the fore and sides of the scrotum, of good size but not over-developed. Does 32 inches (81cm). Bucks 37 inches (94cm). Smooth and short, does may have a light fringe along backline and on legs. Uniform, silver/ fawn to chocolate, sparsely scattered white, cream, sandy or dark hair throughout but not detracting from overall brown appearance. Excessively raised bridge from nose. Flared nostrils. Long or very short pasterns. Horned. Uneven tassels. Rose brown skin on udder. Short pasterns. Steeply sloping or rounded rumps. Cow or sickle hocks. Post legged. Roached back. Sway back. Size differing substantially from ideal. Dropped pasterns. Poor feet. Splay feet. Uneven gait. Weak or narrow chest. Shallow body. Low-set ears. Lack of femineity in does. Lack of masculinity in bucks. Lack of blending in forequarters. Dewlaps. Keel chested. Tan skinned udder. Fleshy, pendulous or unduly divided udder. Uneven udder in adult. Pocket in udder. Teats small, thin bulbous, unbalanced, ill-defined. Lack of dairy quality. Lack of milking capacity. Very small spots of other than main body colour on head or body. Divided uneven or unduly pendulous scrotum. Small spots of other than main body colour on head or body. Loosely attached shoulders and dropped withers. Ewe necked, Cobbiness. Parrot mouth. Obviously undershot jaw. Wry face. Double orifices. Double or supernumerary teats. Patches of other than main body colour. Black coat. Grey underbelly. Pendulous ears. Any white Swiss markings or facial strip. Undescended testicle(s) or one testicle only.